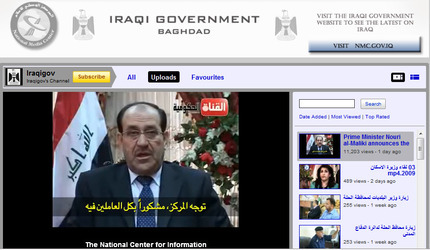 Iraqi Government starts a Youtube channel: what will the comments be like? Delighted to hear that Iraqi Government have just started its own Youtube channel. On it they promise to broadcast official speeches, informal chats, behind-the-scenes footage and there seems to be a simultaneous captioning in English for most of them. As the Prime Minister explains in the most watched video on the channel, the Iraqi government is embracing technology to communicate better with more people, and increase accountability in and outside Iraq. The top rated video is of a school opening in Babil Province, the most viewed is the Prime Minister announcing the Youtube channel. On a less serious note, I was just trying to imagine what the Youtube comments will be like: judging from what’s there already, they’re largely in Arabic. “As Iraqis we are very happy to see Iraqi government making progress in the fields of communication and information technology, wish you good luck Iraqigov”. There may be, but hopefully more good comments than stupid comments. Interested? Become the Youtube friend of the Iraqi Government here. Are virtual Christmas presents the new presents?